The holiday season can get pretty crazy. It feels like we’re all rushing around finalising projects at work, fighting the crowds as we cross off everything on our Christmas shopping lists, all the while trying to figure out where we will spend Christmas and bring in the new year. Some of you have already planned ahead and booked your camping spot well in advance, but some of us may only start thinking about it now or had a last-minute change of plans. 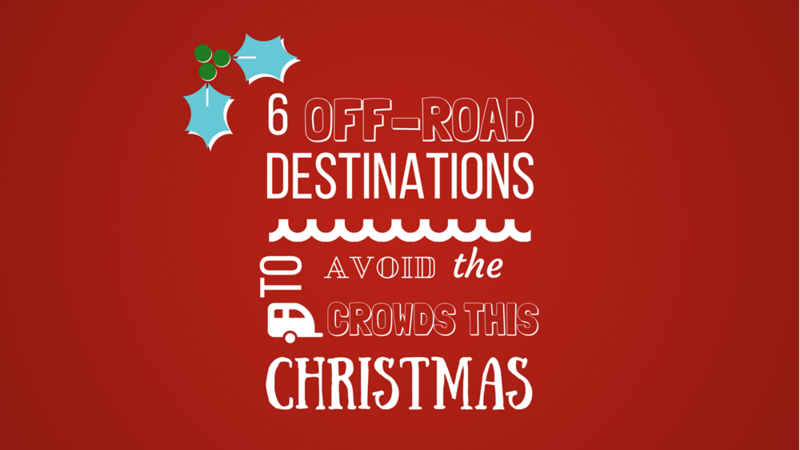 To help out we asked some expert travellers some of the places they recommend to avoid the crowds during Christmas. Only 180kms from Adelaide you will find some of the whitest sand and bluest water in SA. The nearly 20km stretch of beach between Port Victoria and Port Rickaby is my favourite local camping spot and where we love to spend long weekends and Christmas breaks. Being such a vast stretch of beach where you can camp at the water’s edge, it’s a perfect spot to avoid touching awnings and crossing guy ropes with other campers. Other camps are also dotted along the coast off the beach for those who want a bit more shelter or easier access. You must be self-sufficient as there are no facilities in the area, but a short lazy drive to either township provides water, dump points, and Port Victoria has places to get all the supplies you might need to stay on the beach indefinitely. One of the best things about this part of SA is the surrounding region. There are tracks that criss-cross the Yorke Peninsula in every direction meaning a trip to the Point Turton Tavern for a pint and a Parmi or a trip through the Innes National Park make for great little drives. Make sure you buy your permit online or visit the Yorke Peninsula Visitor Centre in Minlaton for more information, at around $50 per week for a permit is a bargain for priceless experiences! One that we would recommend for Christmas travel, would be Tasmania. We spent a month in Tassie during March and April, exploring the coastal areas, hiking in the rainforests, and 4wdriving along the West Coast. The temperatures were cooling off at that time of the year and so we would love to see places like the Bay of Fires and Granville Harbour in the warmers months. There are plenty of things to do as a family, from the more touristy parts of Hobart to the adventure-laden west coast, not to mention the novelty of driving your car on the Spirit of Tasmania. If you are thinking of venturing to Tassie, check our episodes three and four of our web series ‘The Gathering Folk’. I love the South West of WA around Christmas time; the weather is much cooler and bearable, and you are never too far from the coast. Especially around Margaret River, there is so much to do and see, so many wineries, breweries and chocolate factories to visit. There are also a number of really good four-wheel drive tracks to explore and beaches to swim and fish. My favourite spot would be Hamelin Bay, where the massive stingrays are safe to touch. They come right up to the waterfront looking for fish scraps that are thrown into the water near the old jetty. I like to go somewhere we can get away from the heat during the Christmas holidays. South Gippsland offers plenty for the family with some beautiful beaches and activities inland. We enjoy a bike ride and the Great Southern Rail Trail runs through some great little towns like Fish Creek and Foster. We still have the Foster to Port Welshpool via Toora section to go, with plenty of green rolling hills and views of The Prom along the way. The afternoons are spent down the beach at Sandy Point or Waratah Bay with gentle surf and ample space on the beach for the cricket and frisbee. Last time I camped in the area, I jealously watched the family next to us clean their two flatheads and snapper so I hope to put a line in for something fresh on the barbie. With the long evenings, a walk on the beach is rewarded with a fantastic sunset like this one I captured at Waratah Bay. For the last 2 Christmases, we have actually been at home (we are on the road full time), which is both good and bad. We have somewhere to stay no worries and have been fully involved in the Christmas cheer which is nice, but can be frustrating when you have a massive family and have to travel across a large city to multiple family events on one day! This year we will be in a large city on our own, Renee, myself (Nathan) and our 4-year-old son Ryan. We knew it would be hard to find accommodation in our camper trailer and would be crammed in tighter than sardines at a caravan park as well as paying through the roof for the privilege so thought we would try something different; house sitting. We signed up to a website and there were plenty to choose from, so now it will just be the three of us, oh and two dogs, oh and two cats... But no crowds! The other great option for the silly season would have to be free camps - as they cannot be booked years in advance you are more likely to get a spot last minute. They can obviously still be busy and you have to ensure you get there early to get the best spots but if you can stay away from the coast you are a damn site more likely to find a pleasant spot away from the crowds. Personally, so long as you have good people around I don't really care where I am (and there are still plenty of great free camping options on the coast too - as long as you don't mind a few neighbours). We love spending our time on the coast or exploring beautiful waterways but so does everybody else! So, when it's busy like at Christmas time we prefer to escape to somewhere quieter which means we usually head inland away from larger towns or popular tourist destinations. We also like to utilise properties that friends own or websites that list farmstays where you can stay on a beautiful bush property often with a river or creek and have it all to yourself! Located at the top of the KariKari Peninsula in Northland, Maitai Bay is only 4.5 hours drive from Auckland. Being one of New Zealand’s most picturesque bays you can find it busy at times but being so far away from the big city means it is never bursting at the seems like so many other popular spots. The campground is administered by The Department Of Conservation and sites are on a first come, first served basis. There are 100 non-powered sites and flush toilets and cold showers are onsite. You really can't beat this place for fishing, scenery and serenity. Thank you to our ambassadors The Gathering Folk, The Great Escape, The Blonde Nomads and our staff for their helpful travel hints. We hope they’ve helped you uncover a few local gems that get you out on the road and away from it all this Christmas period.